Events and perspectives continue to unfold regarding the end of the Wheat Board monopsony buying/monopoly selling power. (Aside: I tend to use ‘single desk’ and leave it at that, with apologies to all economists and V. Fowke, Canadian agricultural economist and historian). As a regular subscriber to The Western Producer, one of the pre-eminent farm papers, I enjoy reading the letters to the editor. 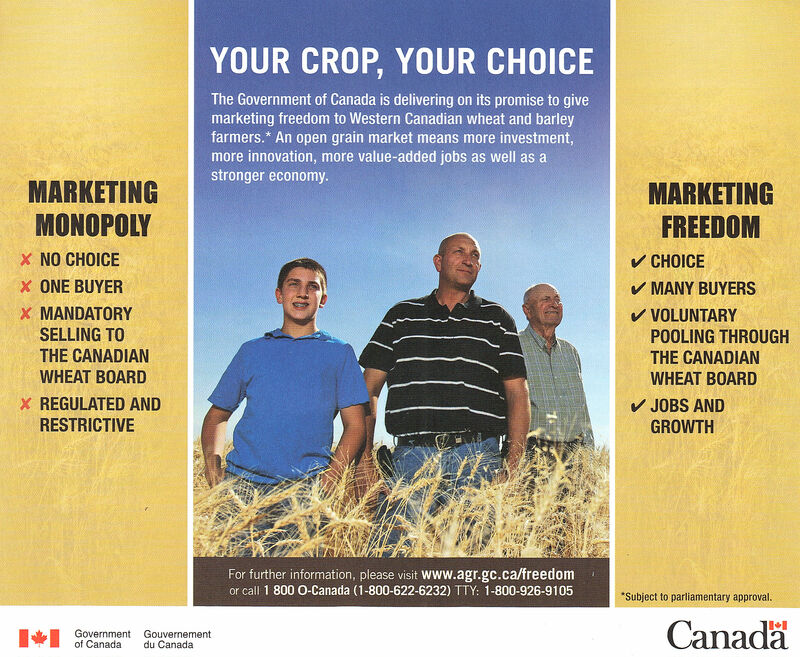 Each week, over the past several years, heated exchanges and debates have brought forth many lesser-known sides to the issue, including past Wheat Board successes and failures, rants, interjections and declarations from politicians and other key players, and a healthy dose of western Canadian agricultural history. Based on truth, lies, fact and fiction (and no one is really sure which is which), the letters are entertaining, informative, and in many cases, attempt to predict the future. 1. Lower grain prices for wheat and barley. Huge grain companies make their money by buying low, selling high. That is called capitalism. 2. Lower grain quality regulation. Already, we see new innovations in malt barley marketing that allows for a grain grade somewhere between excellent malt barley and feed. Can you keep track of the taste of your favourite brew over the next few years? 3. A new rise in co-operative pool marketing. Viterra, once the Saskatchewan Wheat Pool, turned public several years ago. The time will come when new pools will take its place. 4. Serious instability in rural train branch lines, owned and operated by small private shareholders. Much of their profit stemmed from moving CWB grain. With grain no longer under CWB transportation policies, the grain companies and the rail lines are expected to take a much larger cut in the profit, and the rural branch lines could fail. This will put increased strain on an already overloaded truck transportation system, with huge costs for municipalities, as well as farm profits. 5. Legal backlash and lawsuits against the Canadian government for compensation. If the CWB operated with a cash flow in part from grain profits, those profits should be returned to farmers. Of course, the federal government will charge that it has supported the CWB financially — which is also true. The resultant battle will drag on for years. 6. Possibly the rise of the Winnipeg Grain Exchange. Once the bane of the organized farm lobby and the subject of intense scrutiny and hatred, its new form (ICE Futures Canada) is attempting to re-establish a Canadian foothold in the grain market, particularly in the wake of the end of the CWB. 7. Farmers learning to buy and sell futures contracts. Hedging will be a key part of farm economics. 8. Farmers having to purchase Technology Use Agreements and buy new seed every year, similar to what is already done in the canola industry. Carrying your own wheat and barley over and cleaning it for seed will become obsolete. The offshoot will be the gradual demise of small, mobile grain cleaning companies and labs that test grain for germination. 9. Less wheat grown. Without the cushion provided by the CWB, farmers will not be able to ‘shop’ their grain to various elevator companies, trying to get the best grade possible. Wheat contracts will force farmers to sell only to the grain company with whom they made a contract. Then again, on the upside, less wheat grown generally leads to better prices, forcing the grain companies to compete for our wheat and durum crops. 10. More ‘information sessions’ and other local and regional conferences, attempting to sort out the biggest farm question: WHAT HAPPENS NOW? I’ll be attending a few over the next couple of months…! This is a great follow up to your post on The Otter. We could call this “Part IV”. At the beginning of 2014, do we know how the CWB has been faring since the 2012 crop year? I cannot speak for the CWB. My farmgate perspective is clogged rail lines and forward contracts. What do you see?